Hotel is good and is convinient to stay, only problem is that it is too expensive plus internt is chargable and breakfast is not included in the package, breakfast is almost usd 30 if take separetely.Overall an expenisve hotel but is neat,clean and friendly and is menat for business people. A 5 star hotel that has everything you need. Friendly staff. The only things that were a disappointment was going into the room and finding two BIG stains on the bedspread and the curtains were hand drawn and were marked there and the block out curtains had a few holes in it that let in light and showed up the holes. The breakfast was in a lovely room and would have used the pool had we been there more than a night. Location wasn't the best for us as I had hopes of doing a last minute shop in Buenos Aires. Beautiful hotel and grounds, great resturant(main dinning room)& bar. Rooms are nice sized, clean and well appointed. In general, public areas are very nice.Bell- boys, were very accomidating and did agreat job overal. Front desk staff - left a lot to be desired, not very customer oriented. They also need to improve their security in the lobby.If you arrive early(think most flights from USA arrive early morning. We asked for early check in, but because of heavy hotel bookings - we wern't able to get into our rooms until normal check-in time, so if you arrive early would suggest you also book the night before. Hotel was very impressive upon 'arrival'(doorman in a 'top hat' greeted us). Lobby is visually very impressive, as are the 'grounds'.We had a very enjoyable experience in the 'main dinning room'(food was outstanding and service was excellent) and bar, thought prices were reasonable, though not inexpensive, except for breakfast(expensive) - but there are places within easy walking distance that were very reasonablely priced. Good shopping was also close(also within easy an easy walk). Think the hotel needs to improve their security in the lobby area. The Emperador Hotel has has most everything one expects from an "off brand" but well designed hotel. It's best features are its cleanliness, quality of room and surroundings, excellent staff, and location. No place for recreation on the hotel grounds that is out in the sun, so if one likes an indoor swimming pool... it's great, if one would like to sit around a pool and sun, this feature is missing. The Emperador Hotel is very new and well located, with a grand entry and lobby, rich woods and a lush garden ... ideal for enjoying serenity with its weeping wall in the back where water slowly cascades down, feeding a variety of plants along the way. The rooms are very well appointed, and spacious, in a city where other older hotels squeeze rooms out of corners and call them quaint. I highly recommend the hotel. 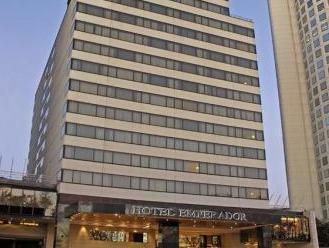 The hotel is well situated just near the train station and is very close to San Martin. It is possible to walk to a lot of the attractions but they are a good distance away. We stayed 2 nights as a stopover and it was more than adequate. Exelente atencion en todas las areas,Habitacion muy confortable,Muy buen desayuno, lo mejor del Hotel: Un jardin ESPECTACULAR. Lamentablemente en este corto viaje a Capital, permanecimos pocas horas en el Hotel, nos hubiera gustado disfrutar mas, pero en otro momento volveremos. Nota: mi esposa se olvido un par de aros chicos sobre la mesa de luz,se podran recuperar? Fuimos muy bien recibidos por Leandro la noche de nuestro arribo entregandonos la habitacion en el sector que nos gusta o sea con vista al jardin.Luego al dia siguiente al jefe de recepcion el Sr.Eduardo nos consigio los boletos para 3 obras que nos recomendo las cuales resultaron extraordinarias y tambien para varios restaurantes que no conociamos que tambien resultaron fuera de lo comun.Recomiendo muy ampliamente este hotel por todo lo expuesto. A localização não é das melhores, a area é até boa, mas em geral tem que sair de taxi. O Emperador é um ótimo hotel 5 estrelas, com preços muito razoáveis, equivalentes a de hotéis bem inferiores. Os quartos são amplos, linda decoração, banheiros bonitos, um desjejum muito acima do nível normas da Argentina, com uma ótima picina "indoor". Não está no melhor ponto da cidade, mas, em geral, em qualquer hotel de Buenos Aires o mais normal mesmo é sempre sair de taxi. Me parece a melhor relação qualidade/preço da cidade. Localização, limpeza, conforto, café da manhã. Âs ligações telefônicas são muitos caras, mesmo as locais. O piano bar do lobby é muito mal explorado, apesar de muito charmoso e confortável. Música ao vivo ou mesmo som ambiente tornaria a permanência no lobby mais agradável. Excelente escolha. O hotel é elegante e sóbrio, com decoração de bom gosto, estilo bem europeu. 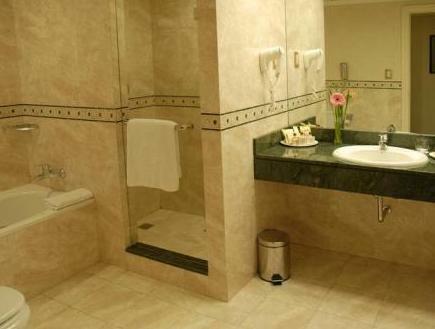 Os quartos são espaçosos e confortáveis, com controle interno de temperatura e uma ducha maravilhosa.O ponto alto é a vista do belíssimo jardim anexo ao restaurante, que faz do café da manhã uma experiência mais que agradável. A surpresa ficou por conta do custa das ligações telefônicas, muito caras (mesmo as locais).